President Obama’s budget may be two months late, but cigar smokers may be wishing it was even later. The president’s budget, announced Wednesday, proposes nearly doubling taxes on all types of tobacco products. The budget includes a 94-cent-per-pack increase in the cigarette tax and would index the tax rate to inflation so it automatically increases over time. A pack of cigarettes is already taxed $1.01. Rates for “other tobacco products”—a federal designation that includes cigars—would increase by the same proportion. In 2009, as one of his first moves in office, Obama signed into law the State Children’s Health Insurance Program (SCHIP) tobacco tax increase, which raised cigarette taxes from 39 cents to $1.04 and raised the cap on cigars from 5 cents to 40 cents. SCHIP was the largest single tobacco tax increase in history, but the new Obama budget would top it. The result would be that most cigars would increase 37 cents in cost. For a box of 25 cigars, that’s an increase of over $9. 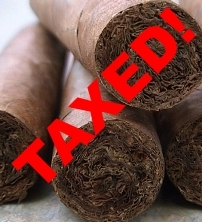 Some less expensive cigars would increase less, but the percentage tax increase could actually be larger. Fortunately for cigar smokers, most political observers consider the proposed budget dead on arrival in Congress. Still, the budget is a starting point for negotiations, and more importantly stands as a value statement for the president, who says the tobacco tax revenues would go towards early education spending. Critics noted that the taxes would hurt small businesses and eliminate jobs. “For specialty tobacco stores that sell primarily tobacco and tobacco-related products, a sales decline greater than what occurred in 2009 to 2010 would be destructive to their businesses and result in store closures and employees losing their jobs,” observed Tom Briant, executive director of the National Association of Tobacco Outlets. In addition, analysts note that not only will the tax increase be passed on to smokers, but over time retailers and manufacturers may end up marking up the increase along with the rest of the wholesale price, resulting in even higher price increases for consumers. Under that scenario, the price of a box of premium cigars could increase by almost $20. Thanks for digging up the possible effects on large/premium cigars. Where did you see that? I looked around yesterday for quite a while and could not find specifics. I also doubt the tax increase happens, but if it does in some fashion, manufacturers almost always pass most or all of it along, and increase markups if they can at the same time. That way, they make more money even with the expected sales decline. It should also be noted that if the tax takes affect as proposed, the rate would be indexed to inflation, so it would go up every year or so.